The latest international data strongly confirms that China has resumed its position as the world’s most rapidly growing major economy. In the year to the second quarter of 2017 China’s economy grew by 6.9% compared to 2.2% in the US, the world’s largest developed economy – China’s economy was therefore growing more than three times as fast at the US. Compared to India, which after China is the world’s largest developing economy, China’s GDP growth was 6.9% compared to 5.7%. China’s growth is particularly striking as it is clearly outpacing both the major advanced centres of world growth, in the G7, and the largest grouping of developing economies – BRICS. The IMF projects that in the five years 2016-2021 BRICS will account for 38% of world growth and the G7 for 30% making China clearly the largest source of world growth – in comparison only one country outside the G7 and BRICS, Indonesia, will account for more than two percent of world growth. A situation where China is both the main source of world growth, and the most rapidly growing major economy, is evidently important for the global economy itself. But this trend also reveals a continuing error of analysis in some sections of the media which during the last period failed to foresee China’s growth. Comparison of projections to actual economic results therefore shows the necessity to draw lessons for more accurate predictions of China’s growth in the future – put technically it revealed the existence of an inaccurate ‘pessimism bias’ in a number of circles regarding China’s economic prospects. To examine these issues first the latest data for China and global growth will be given and then these will be compared to earlier analyses. Comparing China’s growth with the advanced G7 economies the latest data, for the year up to the 2nd quarter of 2017, is shown in Figure 1. 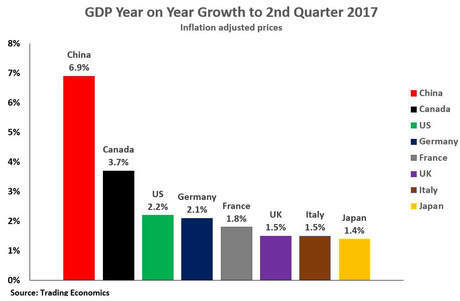 As may be seen, China’s 6.9% growth far outperformed Japan’s 1.4%, the UK and Italy’s 1.5%, France’s 1.8%, Germany’s 2.1%, the US’s 2.2%, or Canada’s 3.7%. Figure 2 similarly shows that China outperformed the main developing economies – the BRICS. China’s 6.9% growth compares to India’s 5.7%, Russia’s 2.5%, South Africa’s 1.1% and Brazil’s 0.3%. The data for Indonesia, the largest contributor to world growth outside the G7 and BRICS is also shown – Indonesia’s 5.0% growth ranked only behind China and India. It is therefore clarificatory to compare these predictions of two years ago to a detailed examination of what occurred during the recent period. Figure 3 shows year on year GDP growth in China and the US from the beginning of 2015 up to the latest data. As may be seen over this period China’s growth fell only extremely marginally from 7.0% to 6.9% – the maximum dip was to 6.7% in mid-2016 with acceleration after this. In contrast, over the period US economic growth fell significantly from 3.8% to 2.2% – with extremely slow growth of 1.2% in mid-2016. In summary China did not suffer a significant slowdown but the US did. The difference between China’s and US performance becomes even more striking when considered in per capita GDP terms as opposed to total ones. This distinction is signifcant because US population growth rate is significantly faster than China’s. This boosts US performance in total GDP terms but, calculated in that way, China’s relative performance in output per person is understated compared to the US.Figure 4 shows that by the time of the latest data China’s per capita GDP growth was over four times as fast as the US – 6.4% compared to 1.5%. The reason for strong economic discontent in the US in mid 2016 approaching the Presidential election is also very clear – as at that time US per capita GDP had fallen to a very slow 0.5%. In summary, contrary to the major predictions collected by the US Council on Foreign Relations, China’s economy suffered no significant slowdown while the US experienced deceleration. To summarise on recent trends and projections regarding China, it is relatively well known that there is a long record of inaccurate predictions that China will experience a severe economic slowdown – that it will suffer a hard landing, that it is a ‘dragon out of puff’ or even that China is going to suffer collapse. Summarising the data from the latest period and comparing it to predictions, however, confirms that a substantial ‘pessimism bias’ still continues in many projections regarding China’s economy. There are, of course, some serious Western analysts of China’s economy who carry out objective analyses – of those which are widely available I would recommend Gavyn Davies blog on the Financial Times. But as the Council on Foreign Relations survey showed the great majority of Western ‘China experts’ are entirely inaccurate in their predictions – they are engaged in propaganda not accurate analysis.The data showing China’s position as the most rapidly growing major economy is therefore both crucial for global economic prospects and in pointing to the necessity of allowing for, and in future correcting, underestimates of China’s economic prospects. But don’t hold your breath waiting for most Western ‘China experts’ to admit that their predictions on China were entirely inaccurate.